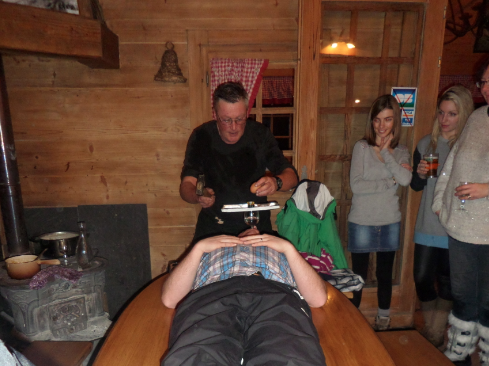 Having been in Morzine for more than 4 years, I could not believe I had yet to experience the wonderment of the Crapahute and finally, on Monday, I got the opportunity. 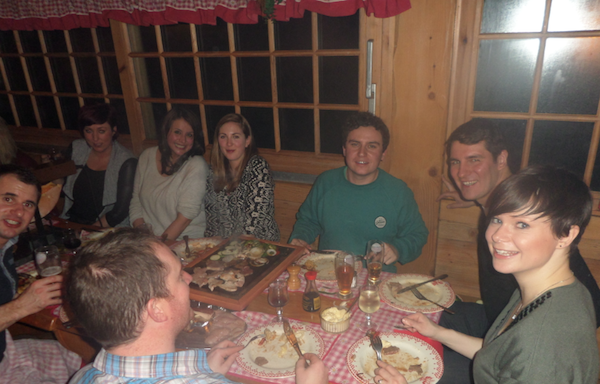 The crapahute is a great refuge up in the hills of the Vallee de la Manche with Mark Dalton as a formidably funny host who will take large parties for a private dining experience throughout the winter. The hut is perhaps, a ten minute walk, from the road through the beautiful trees and Mark will blast out music for your arrival so you can’t get lost. It does get a little steep at the end and I would certainly suggest some sensible shoes! When you arrive at this stunning little hut in the forest with the moonlit slopes stretching out to the back and the snug and cosy Alpine décor, it feels like a little mountain paradise. 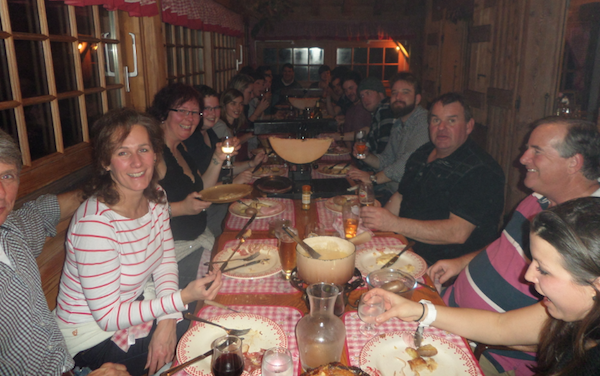 The menu is simply Savoyarde at its best with fondue, pierrade, raclette and tartiflette on offer – I ended up trying a little of each thanks to my generous dining partners and can vouch for the fact you can’t go wrong – it’s all delicious! The evening ended with dancing, games and some great party tricks from Mark which I won’t ruin the fun of but as a little hint…I ended up with my legs over my head in a heap on the floor. Hysterical fun except for the big bruises the next day, though I don’t think falling over is a prerequisite…only if you’re a klutz like me! The whole evening is finished by sledding back down to the road with more screaming, giggling and laughter from everyone. I can’t remember a night where I have laughed more – thanks for a great evening Mark!